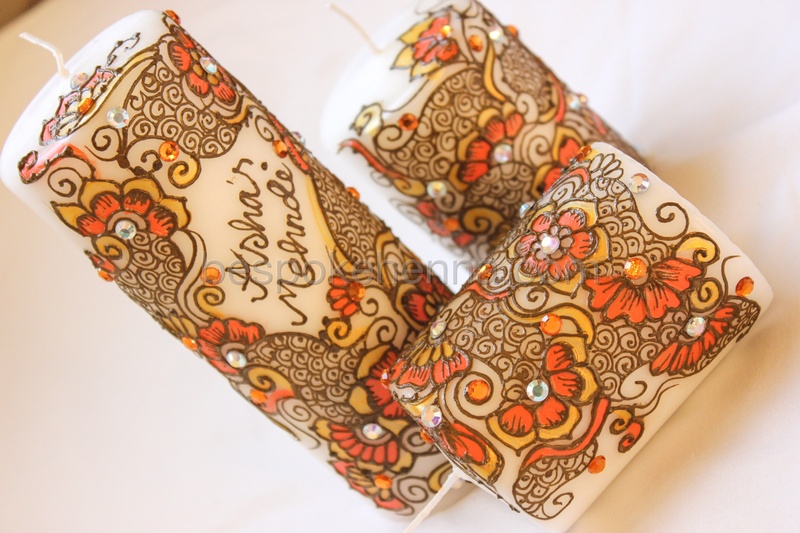 A set of 3 pillar candles hand-painted with pearlescent black acrylic paints and finished off with purple, bright orange, bright pink and AB rhinestones. 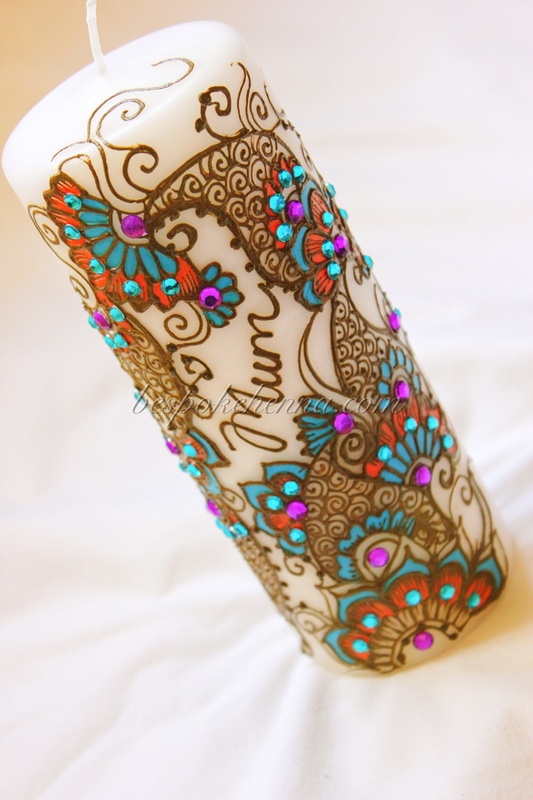 A large pillar candle hand-painted with natural henna and filled in with coral and sky blue acrylic paints. The piece has been finished off with various rhinestones. 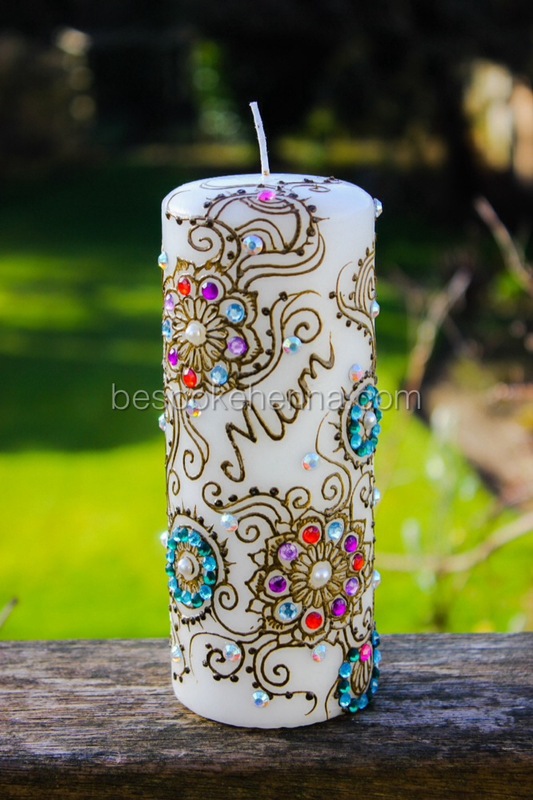 Large wax candle hand painted with natural henna and embellished with multicolored high quality rhinestones. 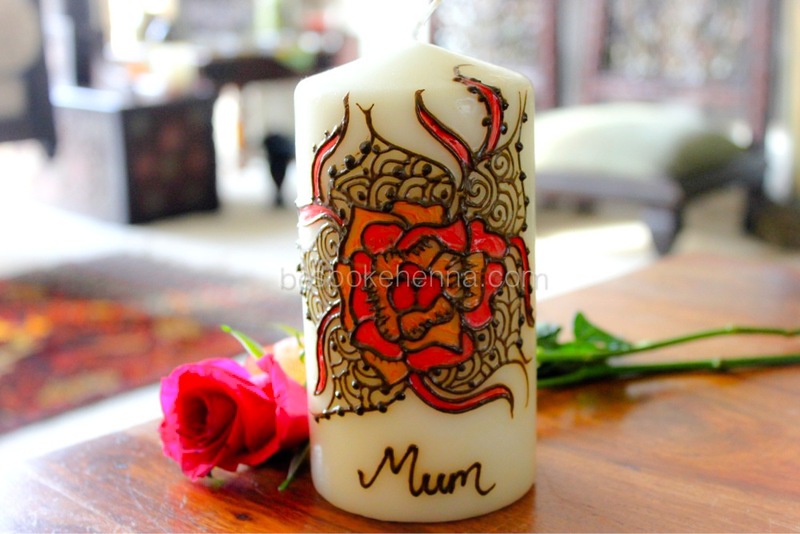 Large vanilla scented candle hand painted with natural henna and various coloured acrylics. Finished with a personal message. 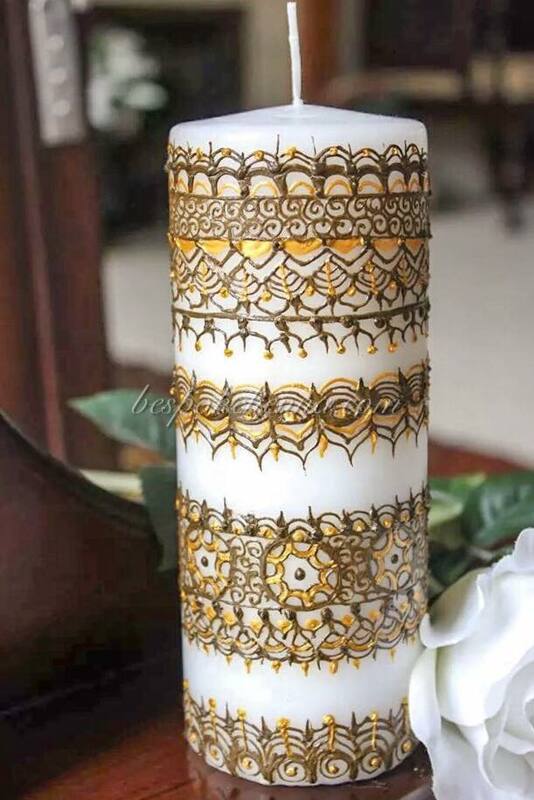 Large intricate tribal inspired pillar candle painted with natural henna and Gold acrylic paints. 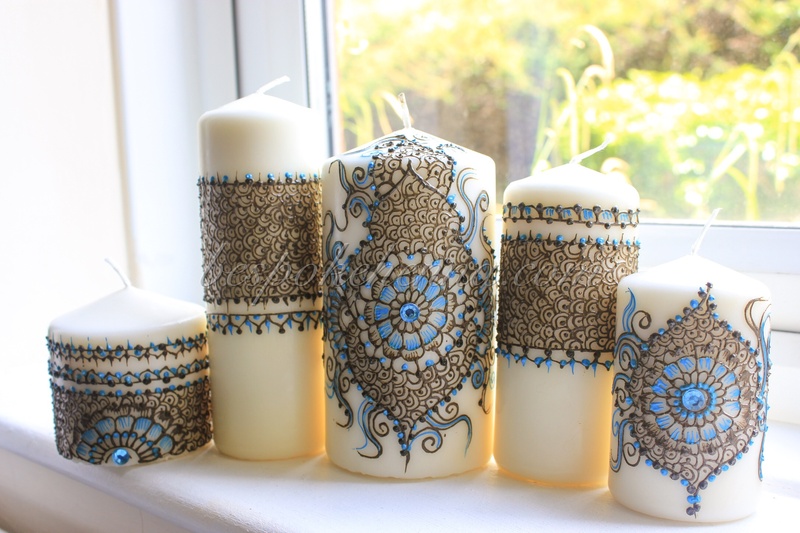 5 ivory pillar candles in a variety or sizes, hand painted in natural henna and sky blue acrylic paints. 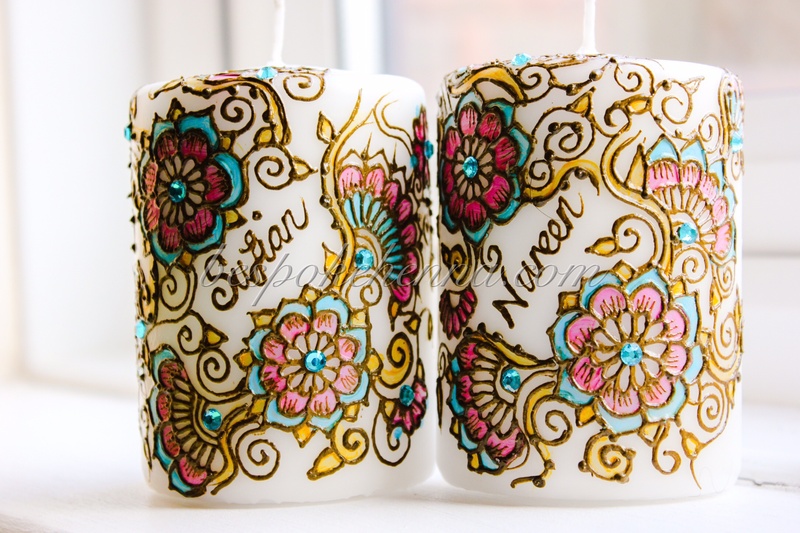 Two medium matching personalised candles painted with natural henna and a variety of acrylic paints. 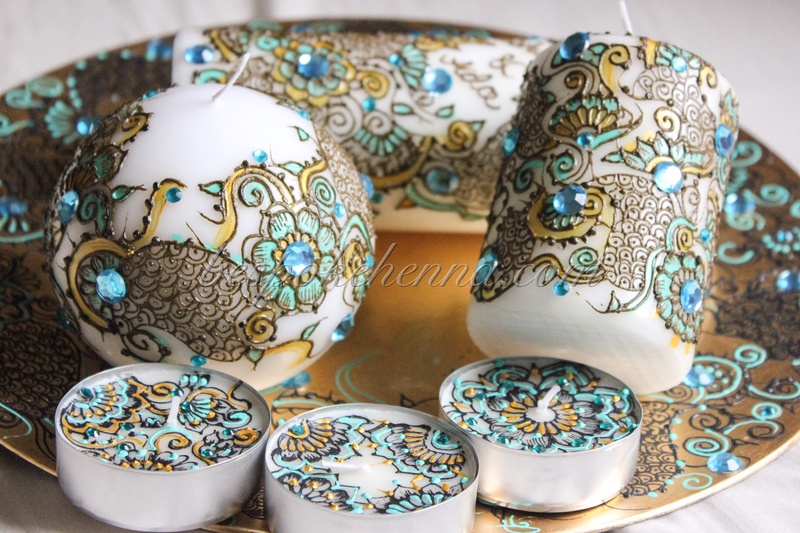 A large pillar candle, a medium pillar candle, a ball candle and 3 jumbo tea-lights complete with a matching charger plate hand-painted with henna and filled in with mint green and gold acrylic paints. The set has been finished off with aqua rhinestones. 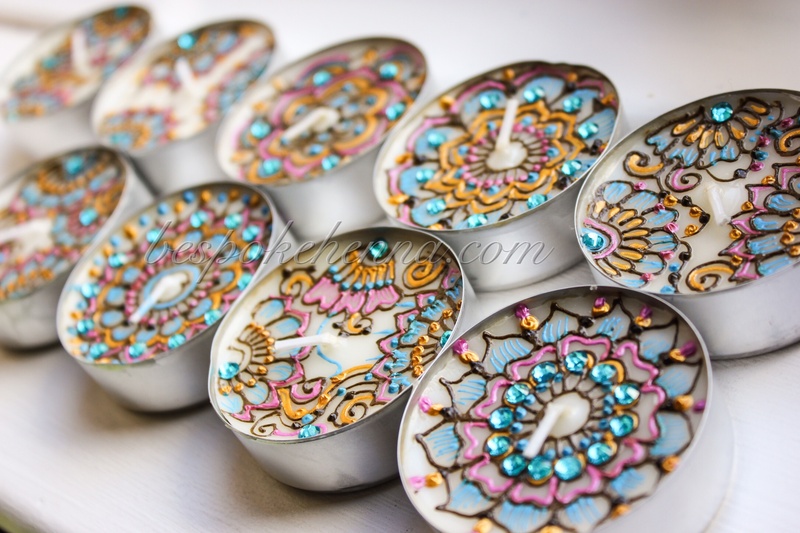 A set of 3 colourful jumbo tea-lights hand-painted with acrylic paints and finished off with aqua rhinestones. 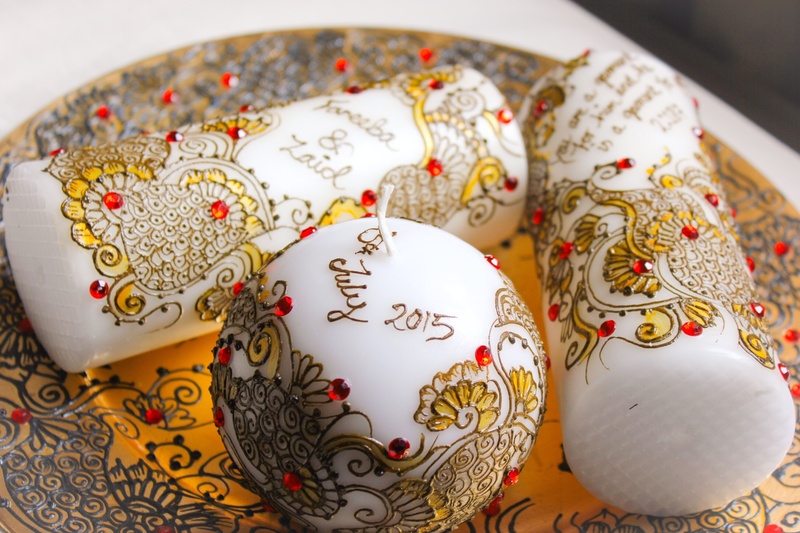 Hand-painted gold charger plate with two matching pillar candles and a medium ball candle. The set has been finished off with red rhinestones. 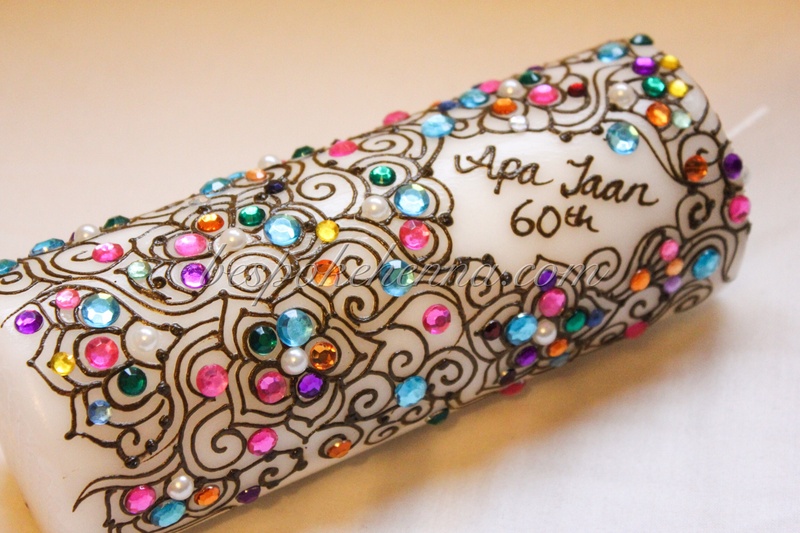 A large black pillar candle hand-painted with sky blue and silver acrylic paint and finished off with a variety of multicoloured sequins and rhinestones. 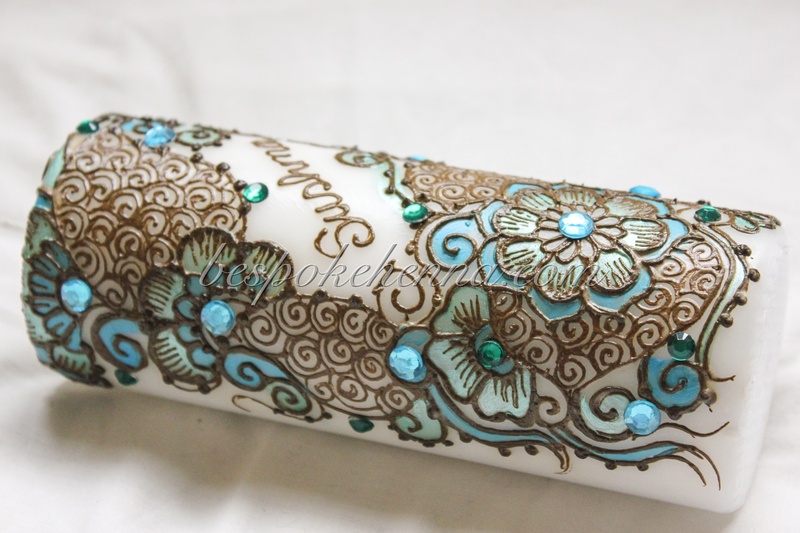 A large pillar candle hand painted with natural henna and filled in with Aqua blue and metallic green acrylic paints . 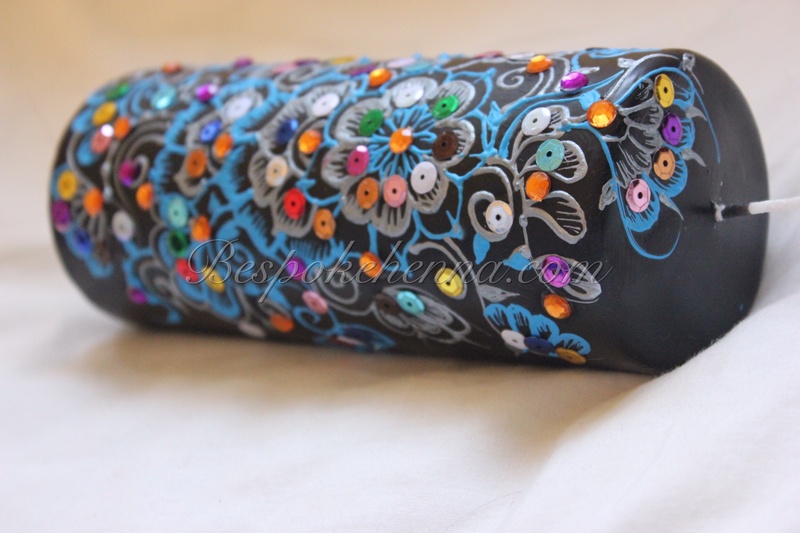 The piece has been finished off with matching rhinestones. 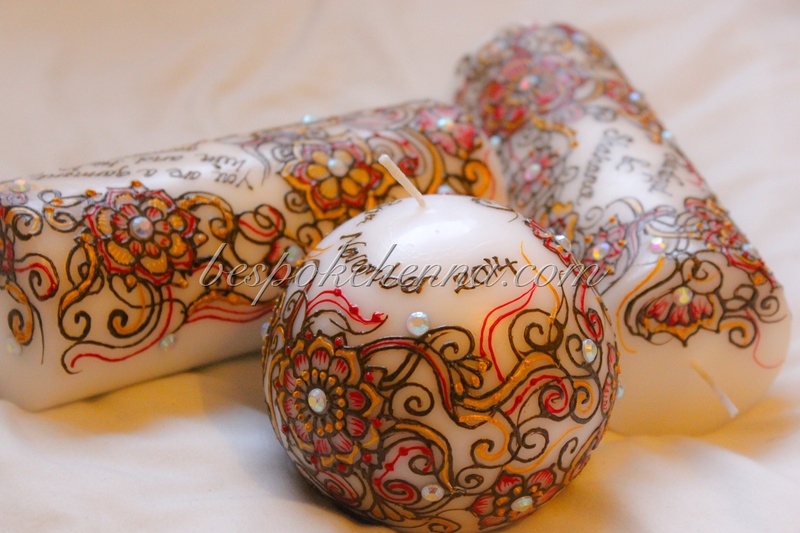 A set of 3 bespoke candles hand painted with natural henna and red and gold acrylic paints. The set has been finished off with AB rhinestones.